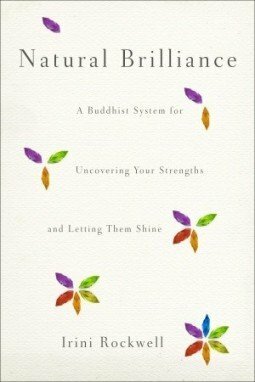 The subtitle of Irini Rockwell’s new book, Natural Brilliance: A Buddhist System for Uncovering Your Strengths and Letting them Shine, reads like a self-help book, and, yes, it is emphatically about helping ourselves. Yet, as you might imagine from a Buddhist teacher, the emphasis of the book is very much about helping us out of ourselves. As Irini writes, “When we are fully present … there is a tangible experience of the boundary of self dissolving and a sense of mingling with sights, sounds, smells, tastes.” Throughout “Natural Brilliance,” Irini acknowledges the richness and basic goodness of our inner world and offers a set of teachings that mean to guide us on the path toward transcending our self by becoming our best self. Available from: Random House, Amazon.co.uk, and Amazon.com. Irini Rockwell, is a senior teacher in the Shambhala community and a student of Tibetan Buddhist meditation master, Chögyam Trungpa Rinpoche. Her first book, The Five Wisdom Energies: A Buddhist Way of Understanding Personalities, Emotions, and Relationships (2002) grew out of her work with the Five Wisdoms Institute where she is currently the director and senior teacher. Irini calls this system of qualities a “model of human dynamics.” Each of these qualities plays out in our personal experience in both dysfunctional and constructive traits. Gaining an understanding of our own unique energy patterns gives us a context for our strengths and weaknesses and the awareness to change in healthy ways. The energy of Karma, for example, can manifest in us skillfully as ‘productivity’ while at different times it can also manifest unskillfully as ‘manipulation’. The trick, as we gain awareness of these conditioned patterns, is to allow our inherent wisdom to guide us toward more skillful behavior. In the tradition of Tibetan Buddhism, these five qualities are overlapping aspects of an all-pervasive energetic dimension of reality that affects our inner world, our interpersonal world, and our relationship to our environment. The five wisdoms are inherent in all of us and can be drawn on at any time. When we begin to understand the unique ways that the wisdom energies play through our own person, we are enabled to redirect the energies in ways that offer us positivity, creativity, productivity, spaciousness and ultimately inner peace. The five wisdoms are pointers that guide us back to a direct experience of our senses and back to an authentic relationship with ourselves and our world. Natural Brilliance, in following its precursor, The Five Wisdom Energies, has the more directed purpose of applying the five wisdoms to our personal, social, and professional lives. The second part of “Natural Brilliance”, for example, a good two thirds of the book, is dedicated to applying the five wisdoms to leadership development and productivity in the workplace. Specific chapters address mindfulness, personal authenticity, intimate relationships, working with others and cultivating wisdom in our professional arenas. In the chapter titled, “Engaging Effectively,” for example, Irini shares with us specifics about how to bring our understanding of the wisdom energies in ourselves and others to bear on workplace dynamics, communication, creativity and conflict resolution. Irini uses case studies, personal anecdotes and detailed exercises to explore the possibilities of engaging with others without reactivity and bias. She offers the five wisdom framework for skillful communication which is based on clear understanding and mindfulness. To the uninitiated, the five wisdoms system can feel confusing and foreign. Like with reading a good novel, I was a few chapters in before I began to ‘get it’. Still, Irini writes with a real passion for the well-being of others and what seems like an uncompromising authenticity. Her personal narratives and real life examples are both instructive and entertaining. As a vehicle of self-understanding, personal enrichment and a tool for engaging with others, the five wisdoms model is intensely powerful. For many of us, engaging with the five wisdoms will be an opportunity to release our attachment to our fixed views of ourselves and open to our beingness as a conduit for wisdom and deep interconnectedness with all things. The five wisdoms offer a thorough template through which to view our personal world, both inside and out. One could only benefit from integrating this perspective into their lives. Ashley has been a licensed psychotherapist and grief counselor in private practice for over 20 years. Author of Transcending Loss, Claim Your Inner Grown-up Shortcuts to Inner Peace, and the forthcoming 75 Habits for a Happy Marriage, Ashley believes that we grow through every experience in our lives and that each of us has access to a place of inner peace and wisdom. Ashley earned a graduate degree in Social Work from Columbia University and a certificate in Contemplative Studies through Smith College School for Social Work. She currently lives, works and writes in Epping, NH with her husband, Daniel, and their five children.